It is so great being here in Yokohama, Japan. I’ve heard it said that the water your mother drank when she carried you will always call you home. Well, fifty-one years after I left Yokohama I have finally returned. It is, for me, quite surreal. We have been here for three days now and haven’t done much. Really it has been down time. It has been like the way you treat yourself after returning home from a long trip. Phasing in, getting some rest, taking care of some of the mundane things in life. Only here, in Japan. The trip here from Shanghai was tough. Our flight from Shanghai to Fukuoka on Air China was delayed. Laurie started to get really ill shortly after we landed. By the time we got to the domestic terminal we found our flight to Tokyo-Narita on Jetstar would be delayed an additional two hours. By this time Laurie was pale and shaking. Our estimated time of arrival was going to put us at the gate in Tokyo-Narita 30 minutes before the last train would leave to get us to our Airbnb in Yokohama. To miss that train would mean we pay $200. for a taxi or spend the night in the airport. Looking at Laurie the latter was not an option. Arriving, the plane parked away from the terminal and we were bussed to the terminal. Good news, the bags were already circling on the carousel! Bad news, a bottle of massage oil had come undone during inspection and soaked through Laurie’s bag. We grabbed our bags and ran. I don’t really know where Laurie found the strength – but you should have seen her run! 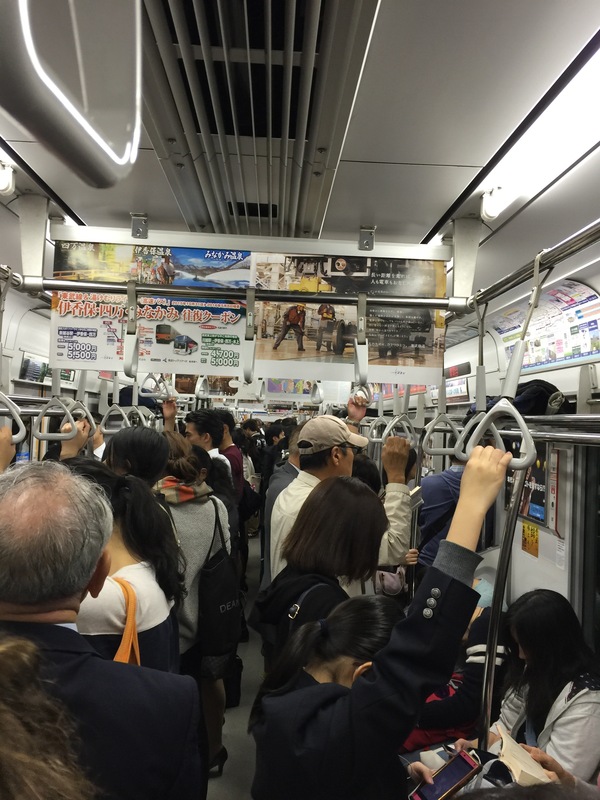 Tokyo-Narita is a huge airport and we made it to the train station with 15 minutes to spare. Two hours later we arrived at our Airbnb. It was 1AM and what should have been an easy day trip had taken eighteen hours. Laurie’s Rick Steve’s backpack, a brand new down jacket, a sleep sack, and one of her Buffs are ruined. Thankfully her clothes were vacuum packed in airtight, waterproof plastic! We have filed a claim with Jetstar. Jetstar doesn’t allow carry-ons over 7kg so we were forced to check our bags. We had intentionally limited our bag weight to 10kg to avoid this. You know the old saying,”just one time won’t hurt….” Well! Anyway, I expect we will be ordering a new one through Amazon before we head to our next destination. We are staying in another Airbnb with a delightful lady in a tiny apartment in the Aobadai section of Yokohama. Our hostess is Keiko. 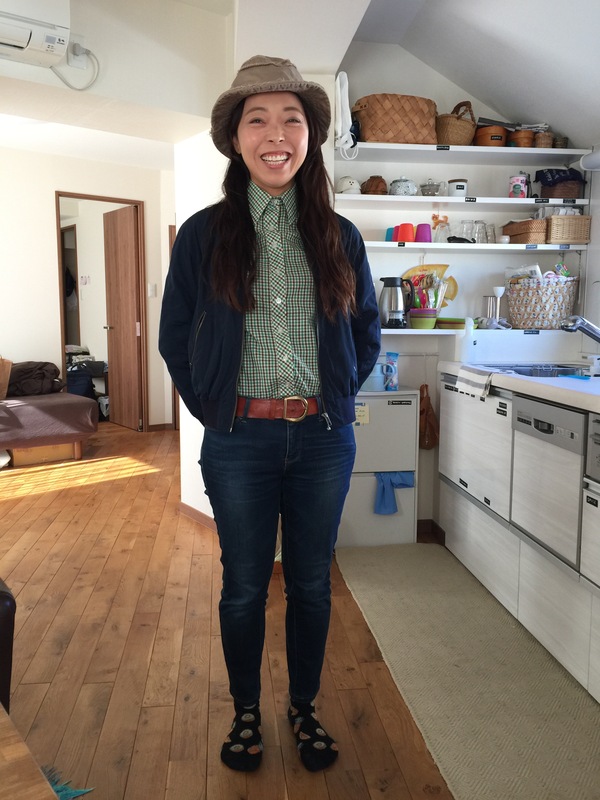 Keiko is 38, single, and a hair stylist. I have had so much fun helping her with her English pop-culture and slang vocabulary. You can click here to see her Airbnb listing and pictures of her home. On our first full day in Yokohama we set out to find some sushi. I wanted some cheap dollar sushi off a conveyer belt. Here in Japan it is called Kaiten sushi. The restaurant I picked was a lot farther away than I had anticipated plus we got lost four times trying to find it. Just part of the fun of travel. Get lost and see what you find. We finally found the restaurant on the Isezakicho Shopping Street. A mile long pedestrian only shopping street full of restaurants, shops, and Pachinko parlors. We made friends with Alex, who had stepped up to interpret for us when he overheard us trying to get directions. 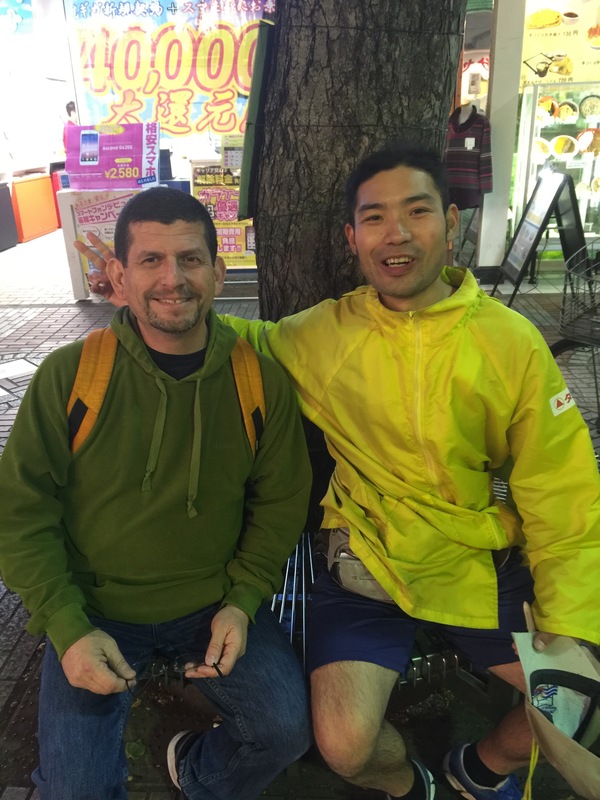 We have found that most Japanese people know some English, but will deny it, and then there are those few that are simply dying to practice their English. Alex falls into the latter category. After talking for an hour we finally headed off for our sushi. Pachinko parlors are everywhere! 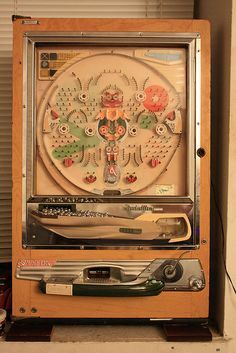 When I was little we had a pachinko machine in our garage that my parents had brought back from Japan. That machine is a far cry from the modern slot-machine like machine of today. We walked into a parlor and took this short video. I had to walk out, without ear plugs the noise is unimaginable. 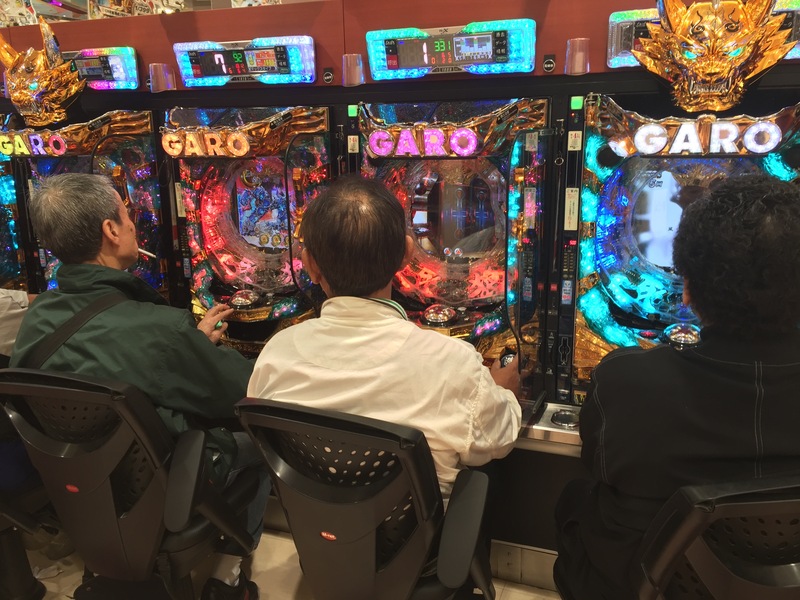 Here is a short video shot when I walked into a Pachinko Parlor. I would like to try Pachinko while I am here but I need to get some earplugs first! Keiko’s place is safe, really clean, and really close to the Metro. However, the bed we are on is hard as a rock. Essentially it is just a box spring. So, of course, we headed off to Ikea. A train, a subway, and then a bus was all it took to get us there! 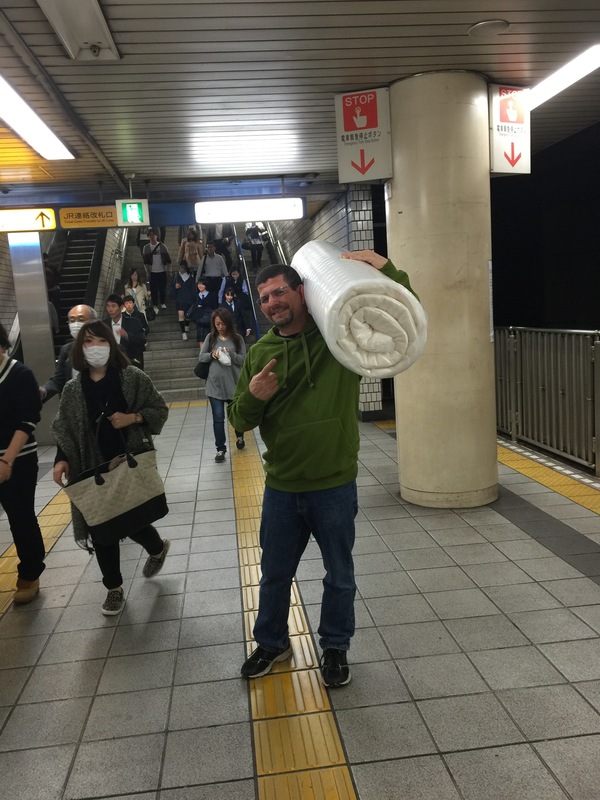 We bought the roll up mattress and a bus, a subway, and a train was all it took to get back to Keiko’s. Oh yes, I carried the roll up mattress the whole way. 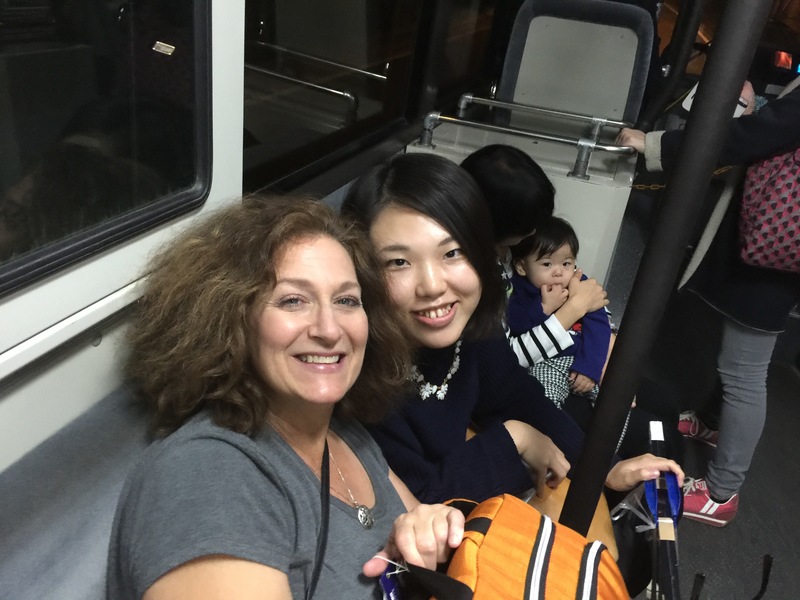 Met a really sweet young lady, Nao, on the bus who really went out of her way to make sure we got back safely. Three times she appeared literally out of nowhere to make sure we were getting on the right train. When we got the mattress back to Keiko’s we discovered it was the wrong size and had to repeat the whole process again the next day. I shot this short video today while waiting to board the Yokohama Blue Subway Line. The train is extra long because rush hour is just starting. These trains come every few minutes and the volume of people they move is mind blowing! On the way back, still carrying the mattress, we stopped to do some grocery shopping for dinner at a grocery store attached to one of the train stations. 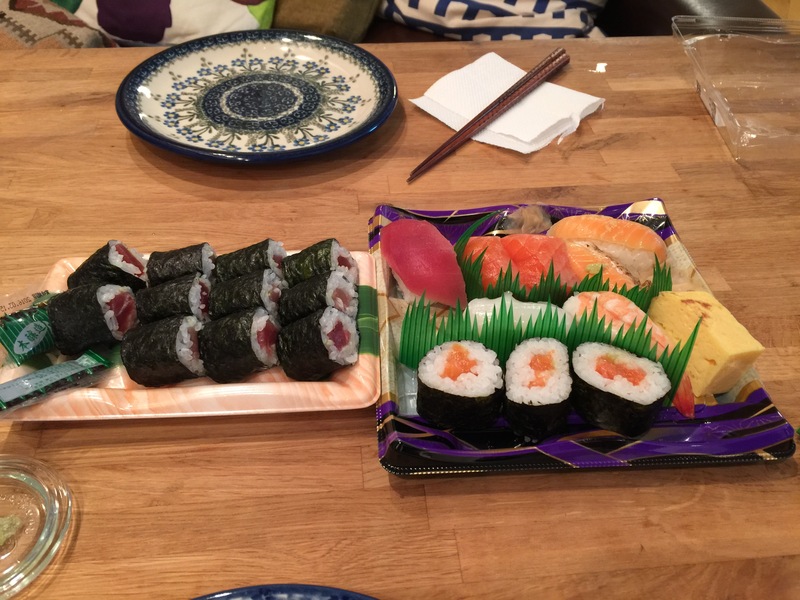 We spent 1,000 yen ($8.80) and brought home the best grocery store sushi ever!!! Really, it was amazing. Tracy and Laurie, I’m really happy to see you guys on such an adventure! I’m enjoying your blog. Thanks for posting it. Hope to catch up with you sometime when you get back home. Take care, and safe travels!